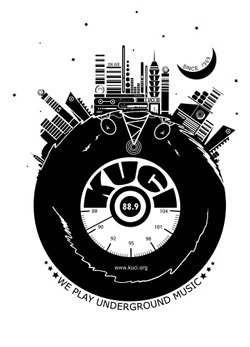 KUCI 88.9 fm is an all-volunteer, non-profit radio station broadcasting freeform radio from the University of California at Irvine 24 hours a day. 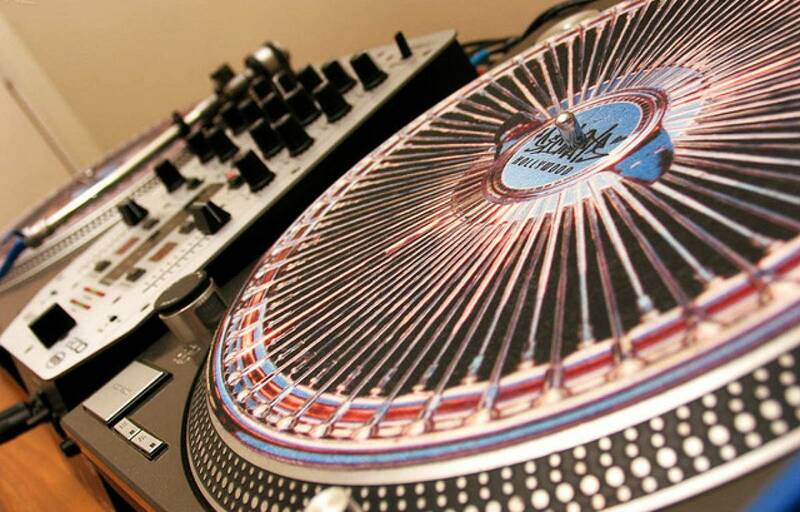 You can tune in to all genres of underground music accented with news, sports and alternative informational programming. KUCI has a wonderfully dedicated staff of student and community volunteers who are willing to explore with and educate their listeners. All of our programs are homespun, we don’t depend on satellite feeds. We create programs from, and for our community. KUCI broadcasts on air to Santa Ana, Costa Mesa, Newport Beach, Orange, and Tustin, California. Since we have a comparatively limited signal, KUCI offers a high capacity webcast at 128k, CD-quality for those with fast connections and a 56k, low-quality stream for dialup connections (if those still exist). This enables KUCI to be heard anywhere in the world. KUCI was conceived in 1968 by engineering student Craig Will and later turned over to Earl Arbuckle, who became KUCI’s first Chief Engineer. In October of 1969, KUCI received test authority from the Federal Communications Commission (FCC) and made its initial broadcast. “Sugar Sugar” by the Archies was the first song played. On November 25, 1969, KUCI was granted its official broadcast license, transmitting 10 watts of power at 89.9 FM. In 1972, KUCI offered its first news broadcast, while in 1974 the station began broadcasting 24 hours a day. In August of 1981, KUCI had managed its way out of a threatening situation. Public radio KCRW in Santa Monica filed with the FCC to increase its power. Approval from the FCC meant that KUCI could no longer be heard from some remote areas on campus, let alone beyond Irvine. Successful efforts on the part of Sue Simone, station Manager, enabled KUCI to move from its original frequency of 89.9 fm to its current frequency of 88.9 fm on August 20, 1981. 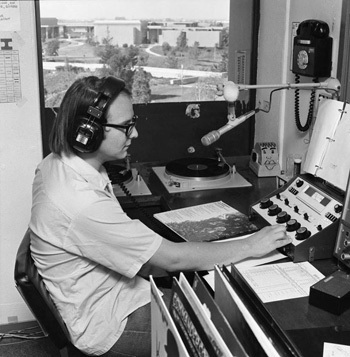 KUCI’s studio in the UCI administration building circa 1972. By 1984, trouble seemed to be lurking once again. Station manager Josh Bleier revealed that KXLU, at Loyola-Marymount University in Los Angeles and sharing KUCI’s frequency, had intentions to move its antenna to a higher location, which would essentially wipe-out KUCI’s signal. This was the first documentation for the necessity to increase the station’s power to “class A,” or a minimum of 100 watts. The autumn of 1986 marked the beginning of efforts to raise money to replace KUCI’s dying transmitter. With the threat of it sending out its last radio waves, a campaign was initiated to raise $7,000 for a new solid-state transmitter. KUCI staged a concert at a Los Angeles Club, the Music Machine, as well as a Jazz/Fusion concert at the Coach House in San Juan Capistrano. After many months of hard work by the staff of KUCI and some lobbying by the station management, KUCI was able to replace its dying transmitter and continue broadcasting. September 1991, the FCC granted approval for the station to increase its power to 200 watts stereo, allowing KUCI to broadcast to more of Orange County than ever before and securing its place on the dial for future generations. On Monday, March 15, 1993, KUCI began broadcasting as a 200-watt station, and calls were immediately received from Mission Viejo and Westminster, opening the door to a larger Orange County audience. 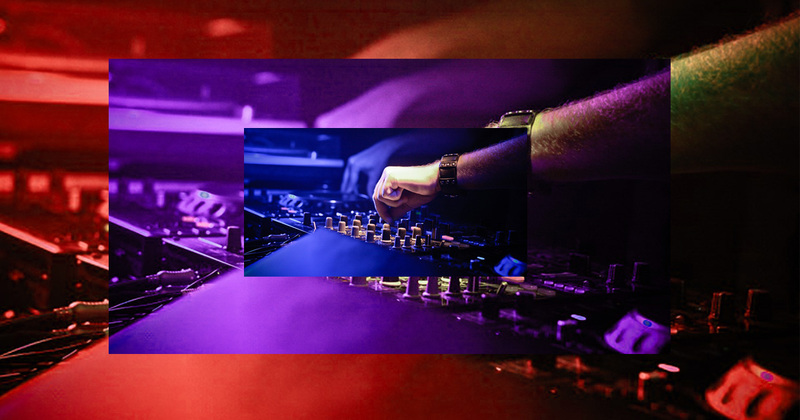 KUCI takes pride in setting trends, and in 1996 the station became one of the first to broadcast its signal over the Internet, opening KUCI up to a worldwide potential listening audience. Today, KUCI’s staff continues its one-of-a-kind programming. Thanks for listening.